Dr. Gar Eufemio of Peak Form has been appointed as President of the ASEAN Society for Sports Medicine and Arthroscopy. For the past twenty years, he has been involved with orthopedic surgery, sports medicine and the sports sciences. This MultiSport's resident health expert successfully devised a series of challenges to assess individual physical and athletic condition. He is an Orthopedic Surgeon who finished as Chief Resident of the UP-PGH Department of Orthopedics and had his fellowship in Sports Medicine at the University of Cincinnati. He was referred to as the “Godfather” for the European Sports Medicine Travelling Fellowship program in 2008. In 2011, he underwent further training on platelet-rich plasma, or PRP, in Milan, Italy. He was past President of the Philippine Orthopedic Society for Sports Medicine from 2011-2014. He practices in Cardinal Santos Medical Center, and at MegaClinic recovery center. 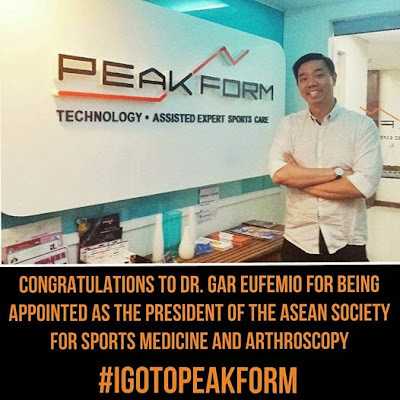 You may also catch Dr. Gar Eufemio at Peak Form, which has all the latest equipment to help sports enthusiasts and athletes stay in their “peak form". Peak Form's facility that brings together a modern physical therapy clinic, the leisure of a spa, and the tested sports science concepts. With Dr. Gar Eufemio leading the team at Peak Form, anyone can confidently say that, "I’m glad #IGoToPeakForm."